​Gentle yoga practice and education on how yoga can help reduce treatment side-effects. Learn simple and effective evidence-informed yoga practices that may reduce pain, fatigue, lymphedema, neuropathy, anxiety, and insomnia. The combination of intention setting, movement, breathing, sound, mudra, and guided visualization empowers a positive connection to the body and soothes the mind and spirit. Open to cancer patients, survivors and care-givers who are looking for a way to incorporate self-care into their healing journey, and build community in the process. S​ponsored by The Wellness Station and You Call This Yoga. A yoga class blending the safety of Hatha alignment with the subtleties of contemplative practice. You will be guided through gentle floor warm-ups, kneeling, and standing poses that build strength, flexibility and balance. Time will be dedicated each class for pranayama (breath work), mudra (hand gesture), sound practices and deep relaxation. This combination transforms you from stressed, tight and achy to relaxed, open and blissful. All levels welcome; perfect for beginners and older adults. Self-care is not an indulgence, it's a necessity! Enjoy a feast for the senses, an evening session of restorative yoga, Reiki, and therapeutic aromatherapy in the Urban Zen style. You will be guided through a gentle restorative practice using bolsters, blankets and other props to fully support the body in restful reclining positions. Reiki will then be offered through light touch, directing healing energy where it is most needed. The space will be infused with pure essential oils to further engage the senses and to relax the mind and emotions. These modalities combine to create a blissful experience that will ease the stress and strain of daily life. Cheryl is a C-IAYT yoga therapist and a Holy Fire® III Karuna® Reiki Master. I can not say enough about Cheryl’s yoga classes. Her instruction style is very gentle, with adaptations for anyone’s yoga level. Since taking her classes I sleep very well and no longer wake up stiff or achy in the mornings. My hips and back are stronger. I truly feel like I walk taller through my day. I would encourage anyone to join her classes, from beginners to the most experienced. Everyone will walk away with positive results. Cheryl presents a relaxed, disciplined and focused yoga class. I appreciate her anatomical knowledge, verbal clarity and ability to create ease (emotional, mental and physical) in her students. Her practice increases my efficiency and deepens my peace. I especially love it when she sings to us during Savasana. At the right time with the right credentials, Cheryl fits into my life which includes thirty years of participating in Yoga classes. My aging and anemic body needs modifications and understanding while not sacrificing the principles of practice that keep me strong, balanced and flexible. Cheryl's approach is kind and caring with an individual focus. She embodies what she teaches..
Cheryl came to our community building to teach for us (so nice to not have to drive to a yoga class!) and she was wonderful at gently leading participants of all levels and abilities. I have done yoga for many years, but Cheryl was excellent at ensuring that our poses were correct and safe. I learned a lot and will take classes from her again! Cheryl is the best yoga teacher I have ever had. We are taking her Gentle Yoga class (since July) and she is the only teacher who has made sure we are doing the poses correctly and offers alternate ways to do each pose. Others I have had just expect you do do the pose or give poses that are too difficult to do. She is knowledgeable, thoughtful, encouraging, reassuring, and an overall delight! I could go on singing her praises! I have been with Cheryl for more than 4 years on a weekly basis and she is the PERFECT teacher. She mimics all the moves while guiding our small group of 8 women and is patient and as "hands on" as she senses we want to be. We have been a close knit group of friends - with diverse senior abilities - meeting weekly in a private home for more than 20 years so we know our preferences! She has been a perfect teacher for us. She will be a wonderful teacher in her new neighborhood and we are so sorry to see her leave Northern California. Cheryl is the best yoga teachers I have ever experienced. She explains poses, reminds about breathing, demonstrates poses really well. There are many qualities an excellent yoga teacher has and Cheryl is one teacher that has them. I joined Cheryl's yoga class about 2 years ago when I returned to work following a serious head injury. Cheryl is sensitive to the medical conditions of her students and how yoga can be a part of a healthy lifestyle. She has been a healer of my journey back to fitness and health. Cheryl is quite extraordinary. She's devoted her life to teaching and has an extensive knowledge of yoga and Sanskrit that she brings to the classroom. Her preparedness, quiet intelligence and easy humor have all generated a loyal following among her students. Under Cheryl's tutelage, I have regained much more mobility and flexibility in my joints, and have learned to listen to my body, so not to cause further injury. Cheryl's strength is in her superb teaching. She has an extensive knowledge of anatomy and thoroughly explains the "what" and "why" of our exercises, so that her students gain a better understanding. She designed and taught a home practice series, so we may practice Yoga on our own. Cheryl has been my favorite yoga teacher for more than a year. Besides her always warm & friendly style, there are two main things I can identify that make her such a good yoga teacher for me. First is her thoughtful approach for every class; she always has a careful plan that's just right for the class and that helps us all get where we are going. Secondly, her teaching combines extensive understanding of human anatomy with some easy contemplative practices. This mix makes every class session varied, and yet full of opportunities for growth and relaxation. I totally recommend yoga with Cheryl! She's a gem! ​Cheryl blends restorative yoga poses with a gentle spiritual practice that sooths the mind and strengthens and relaxes the body. I look forward to her class as a gift to myself and a touchstone to remember to practice vigilant self-care in this crazy world. Cheryl's classes have always been top-notch: well-paced, thoughtfully articulated dissections of movements and positions. They did not feel like "workout" routines. Instead, I have always felt "balanced" -- physically and mentally -- afterwards. The music you shared was a signature feature and enriched the experience. I also have appreciated her respect for moderation. i.e., "more" is not always better. It's always tempting -- especially if a yoga teacher is encouraging it -- to try to force one's body into extreme positions, hold poses for very long times, etc. But the downside is that one can get injured in doing so. Especially if one has a 50+ body! And, as she often points out, that approach isn't necessary. Notably, in her classes, I always felt "safe" . . . that she was concerned that none of us hurt ourselves in the course of the practice. Cheryl has been my favorite yoga teacher for more than a year. Besides her always warm & friendly style, there are 2 main things I can identify that make her such a good yoga teacher for me. #1--her thoughtful approach for every class; she always has a careful plan that's just right for the class and that helps us all get where we are going. #2-- her teaching combines extensive understanding of human anatomy with some easy contemplative practices. This mix makes every class session varied, and yet full of opportunities for growth and relaxation. I totally recommend yoga with Cheryl! She's a gem! Cheryl's teaching has been very beneficial to me as a senior yoga practitioner. 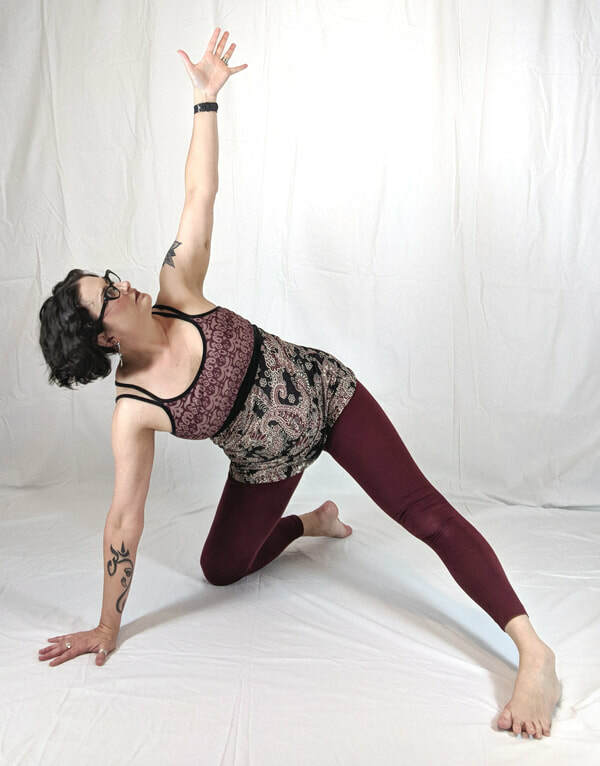 She makes yoga more accessible with her warm teaching style and choice of poses. At 67, I decided to give yoga a try. Cheryl has impeccable credentials. She is knowledgeable, personable, kind, and has an excellent sense of humor. I have taken private sessions and group classes with her. She is excellent at demonstrating and explaining poses and has many suggestions to adapt poses to the individual needs of clients. Due to a serious accident, I have needed a teacher who would keep me safe, encouraged, and motivated. Cheryl is amazing and highly recommended. Before my last birthday I had a dream that I could do cartwheels and handstands. I had never had much success with handstands nor was I able to do cartwheels as an overweight, not very athletic little girl. As I approached my mid-fifties, I felt very "heavy". Not weight-wise in pounds, but mentally and physically. I wanted to take more chances, not be afraid of failure, have more confidence, take myself less seriously and generally lighten up! I really wanted to be able to kick up into a handstand and maybe even do a cartwheel. My husband said that if I could find someone to work with me (which he doubted) he would give me personal training sessions for my birthday. I was apprehensive and not certain it was even possible at my age. But when I approached Cheryl, she was very positive and she became my personal yoga trainer. She mapped out sequences to help my strength and flexibility which I worked on weekly with help and at home. Cheryl helped me develop a personal yoga practice to help me achieve my goals. We worked on visualizing the handstand. I found that after a few weeks there were some wonderful bonuses that I had not anticipated. I could wear sleeveless blouses for the first time in years because my arms had shaped up and the roll of fat under my bra was gone! I was even walking down the hall with more confidence, taller and holding my head higher. I could feel and flex muscles in my back that I didn't even know I had and I felt much lighter. With Cheryl's help my kicks got higher and I gained the confidence that my arms could hold me up. During one session, after just two months, I was able to do three assisted handstands, one I stayed up for over 30 seconds (but who is counting). With Cheryl's help my dream became not only possible but a reality! I take yoga with Cheryl at the Kaiser Permanente corporate class and she encourages us to incorporate yoga into our work day by recommending poses and stretches that can easily be done at our desks. I feel that I am more productive when I attend her class and incorporate some of her suggestions into my work day.